Still haven’t decided where to go on holiday this year? How about adding the Caribbean island of Aruba to your list of dream destinations? Then I read the email again, and realised that I wasn’t going to be flying off to the Caribbean. However I did receive a selection of Caribbean foods and drinks, to give me a taste of Aruba at home. Aruba is just 19 miles long and 6 miles across, and lies in the southern Caribbean. It has glorious white beaches, temperatures around the 28C mark, and there is rarely a rainy day. That certainly sounds like a heavenly beach holiday location to me! Caribbean food is a melting pot of different cuisines, and Aruban food has been influenced by more than 90 nationalities. Aruba’s rich multicultural past has seen it swap hands between the Spanish and Dutch several times over the years. And this heritage comes across in the diverse flavours of Aruban food. My selection included sweet and savoury foods, and some spicy treats as well. The boys fell on the caramel filled Stroopwaffels and Shirley biscuits straight away. While they were distracted, I quietly hid the plantain chips away from their view. I have a weakness for plantain in pretty much any form, and these are delicious! 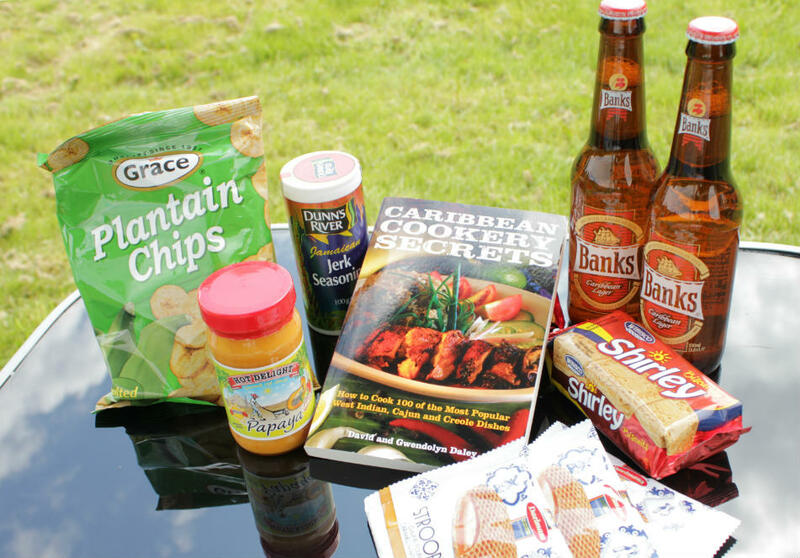 Jerk Chicken is another favourite, so I was really happy to see a Caribbean jerk spice in the hamper. The sweet/spicy papaya hot sauce is just delicious – enough heat to make your mouth water, but without blowing your head off! And the Banks beer you can see in the picture above is popular across the Caribbean. It’s that light, slightly dry kind of lager that is so easy to drink on holiday, or even just at your next barbecue! I was also sent a copy of Caribbean Cookery Secrets. This book includes favourites like Jerk Chicken and Rice & Peas, as well as lesser known recipes like Anna Maria Salad and Jamaican Patties. As my family all love Caribbean food, I think I’ve found my theme for next month’s Father’s Day barbecue (weather permitting!). Also in my hamper of goodies was a little sachet of Speculaas spice mix and a speculaas biscuit mould. I’ve loved the warm, gentle spice of speculaas ever since I lived close to the Dutch border in Germany as a little girl. So has all this talk of perfect white beaches and delicious food given you an appetite for Aruba as well? 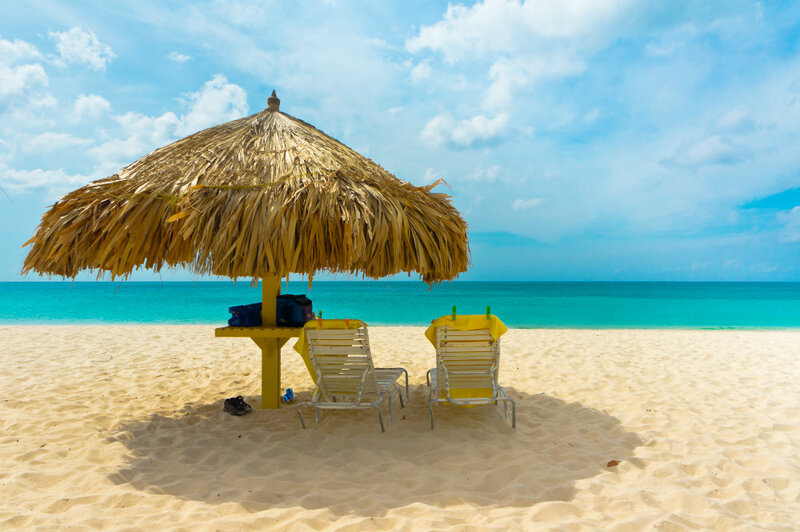 Why not pop along to the Aruba Tourism Authority UK website for more information or visit Kuoni to book your holiday now. Hi, I'm Sally Akins and this is my travel and lifestyle blog, with a touch of luxury. I love architecture, the sea, good food, and high thread count sheets. When I'm not travelling, you'll often find me out and about in the Shropshire countryside. Aruba is on our list for next year, as it will be our first holiday with our little one. It looks beautiful! That sand would be gorgeous for kids to play on! Oh me too, I’d love a break right now! Aruba is stunning and one of my sisters is called Aruba but spelt differently. It is a gorgeous island and the food looks so good. It looks amazing, doesn’t it? I’d love to go! Aruba sounds amazing. I’d definitely have to try some new cuisine if I took a trip there. I love that it’s been influenced by so many cultures. I love the idea of all those influences on a country’s cuisine, it sounds really exciting to me! Wow I would love to visit this place. I love the sound of it. Plantain chips?! I would love to try them! They’re that kind of dangerous snack – open the bag and suddenly they’ve all gone! It sounds absolutely perfect, doesn’t it? Enjoy your holiday – we’re heading back to Portugal this summer! The goodies sent look absolutely delicious, I am adding Aruba to my must visit list. Gutted you didn’t get to jet off to the sun, sea and sand! Often the food is the best part of a holiday though! I definitely agree with you there, I always look forward to the food when we go away on holiday! It’s nice to get to try new food even if you didn’t get a chance to go. I like jerk chicken, yum! I’m really looking forward to trying out some recipes soon! They’re all so delicious, I can’t wait to try out the recipe book! I would absolutely love to go to Aruba! I love the caribbean and all the foods there! I have entered the competition!!! I honestly would have never thought of going here. This is why I like to read blogs. They give me ideas for new travel destinations! I’d heard of it, but didn’t really know anything about it. Now I really want to go!! It’s such a fab competition prize – someone is going to have an amazing trip! I’d love to go on holiday in Aruba… or anywhere hot for that matter… I love Caribbean food! Shamefully I’ve never heard of Aruba. With the weather right now I want to jet off tomorrow. I love bringing food home with me, it is the best souvenir. I agree – I could definitely do with some of that weather now! As they said, the best way to know the place is through its food! It looks like the perfect place to go to with children: blue skies, lovely food, white sand… I need a holiday! I completely agree – I’d love to go there right now! Amazon and the Amazon logo are trademarks of Amazon.com, Inc. or its affiliates. As an Amazon Associate I earn a fee from qualifying purchases.